What information is required for my initial FREE CONSULTATION? If I co-signed for a debt, does bankruptcy affect the obligation? What if I do not list a creditor on the bankruptcy papers? Does a bankruptcy relieve me of all my debts? After bankruptcy, can I obtain new credit? Will the fact that I filed bankruptcy appear on credit reports? If my creditors ignored the automatic stay, what could be done? What is the "automatic stay?" What happens after I file a bankruptcy petition? Are pension plans and 401(k) plans exempt? Do I have to attend a Financial Management Course or receive a Discharge under Chapter 7 Bankruptcy or Chapter 13 Bankruptcy? 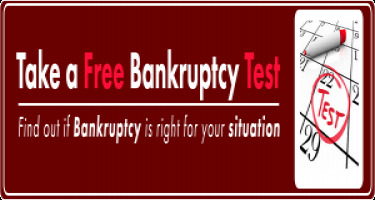 Do I have to attend Credit Counseling to file for Chapter 7 Bankruptcy protection? Can I go to jail if I don't pay my debts? Will bankruptcy stop creditor calls? What is the general process in consumer bankruptcy cases? What should I do if I find mistakes in my credit report? How can I re-establish credit after bankruptcy? What about non-attorney bankruptcy petition preparers? The least you will need to know is your gross monthly income for the last six months for all wage earners in the household, regardless of who may be filing and/or responsible for the debt. Plus, you will need to know your necessary monthly expenses such as rent, mortgage, food, gas, car payment etc. Other information that will allow for a more detailed analysis of your situation is listed below. 4. Copies of all judgments and lawsuits and liens pending against you. If your wages are being garnished, a copy of the wage garnishment order and your employer's fax number will expedite our office stopping this action. 8. If you are married and filing a separate case, a copy of your spouse's paycheck stub showing net and gross income. In Florida, filing a petition with the bankruptcy court commences a Chapter 7 bankruptcy proceeding. The person filing a Chapter 7 is referred to as the "debtor." Generally it will take about two years to substantially rebuild your credit. In 18-24 months after a bankruptcy, you may be able to qualify for a mortgage. Generally, student loans are not discharged in bankruptcy. Although there are possible exceptions to this general rule if you can overcome an undue hardship on the debtor and/or debtor's dependents - very hard to overcome. 10. Student Loans (unless you can prove "undue hardship” which is almost impossible to do). Certain property is exempt and you will be able to keep that property. We will discuss what property is exempt and how it may apply to your situation during your free initial consultation. If you are an individual and are injured by your creditor's willful failure to comply with the automatic stay, the law allows you to recover actual damages, including costs and attorneys' fees, and, in some circumstances, punitive damages. There are some exceptions, for example, a bankruptcy petition does not stay the commencement or continuation of a criminal action, an action to collect spousal support, or an action to enforce a government's police or regulatory power. The bankruptcy court will mail to each of your creditors a "Notice of Commencement of Case", informing them that you have filed the petition and advising them of the date of the First Meeting of Creditors. The United States Supreme Court has held that pension plans, 401(k) plans, and other "ERISA-qualified plans" are generally "excluded" from the bankruptcy estate. Yes. Under new bankruptcy legislation enacted in October, 2005, before you can file a petition under the bankruptcy code under either Chapter 7 or Chapter 13, you must seek Credit Counseling first. Bankruptcy petitions are public records. However, under normal circumstances, unless your employer is a creditor, it will not know you filed a bankruptcy petition. If your employer is a creditor, it must be listed as a creditor on the schedules and will receive notice of the bankruptcy proceeding. In urgent cases, we will contact the creditor immediately upon filing the bankruptcy petition, especially if a lawsuit is pending. If a creditor continues to use collection tactics once informed of the bankruptcy, it may be liable for court sanctions and attorney's fees for this conduct. When we help you file for bankruptcy, we ensure that an "automatic stay" goes into effect and is enforced. The automatic stay prohibits virtually all creditors from taking any action to collect the debts you owe them unless the bankruptcy court lifts the stay and lets the creditor proceed with collections. In a Chapter 7 bankruptcy case, we will file several forms with the bankruptcy court disclosing your personal and real property, your income and expenses, debts and property transactions. The Bankruptcy Court will appoint a person called a "Trustee", who is assigned to oversee your case. About 30 days after your case is filed, we will accompany you to the "Meeting of Creditors" where the trustee reviews your case, verifies your identity, and may have a few basic questions. Despite the name, creditors rarely attend. The meeting lasts only a few minutes. A couple of months later, you should receive a notice from the court that "all debts that qualified for discharge were discharged." Under some circumstances you may be able to keep some credit cards if the creditor agrees. However, it is normally not wise to reaffirm unsecured credit card debt. • Incorrect account histories -- such as late payments when you paid on time. • Any account you closed that don't say "closed by consumer." Credit reports are compiled by credit bureaus - private companies that gather information about your credit history and sell it to banks, mortgage lenders, credit unions, credit card companies, department stores, insurance companies, landlords and even employers. Credit reports also include non-credit data such as names you previously went by, past and present addresses, Social Security number, employment history, marriages and divorces. The Rules of Bankruptcy Procedure require you or your attorney to certify that your petition is not filed "for any improper purpose, such as to harass or to cause unnecessary delay." Bankruptcy is intended as a tool for dealing with debts that can not otherwise be paid. You should not file a bankruptcy petition for the sole reason of delaying a creditor's actions. 2. Do NOT transfer your assets to friends, family and business associates to protect the assets from your creditors. The transfer may be considered a fraudulent conveyance. If it is, you may lose both the property and your right to a bankruptcy discharge. 3. Don't destroy any business or financial records. You can lose your right to a bankruptcy discharge as a result. Not exactly, sort of. About 30 to 40 days after filing the bankruptcy petition, you will have to attend a hearing presided over by a bankruptcy trustee. This hearing is called the First Meeting of Creditors. The trustee is not a judge, but an individual appointed by the United States Trustee to oversee bankruptcy cases. Bankruptcy in Latin means filling out forms. Well not really, but that is what it should mean. We will ask you to fill out forms to provide us with the information needed to prepare the bankruptcy petition. We will use the information you provide to complete the official forms. In Florida, almost any individual, partnership, or corporation may file a chapter 7 bankruptcy petition if he or she resides, has a domicile, a place of business, or property in the United States. If you were granted or denied a Chapter 7 discharge in a prior case within the last 8 years, you might not be entitled to receive a discharge in a subsequently filed Chapter 7 bankruptcy in Florida. Bankruptcy petition preparers are not permitted to provide you with any legal advice. The bankruptcy petition preparer's role is limited by law solely to typing. Individuals may file a bankruptcy petition without an attorney. Keep in mind that the bankruptcy code is very complex and filing a bankruptcy petition requires a thorough knowledge of the bankruptcy code and other laws.